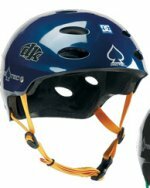 The Pro Tec Ace is a Freestyle helmet which has quickly become the most recognized on the street. Protecting the wicked minds of Ryan Guettler and Chris Doyle, the Ace is now equipped with SXP multi-impact technology, giving you the protection our top athletes demand. SXP Technology: Surface activated eXpanded Polypropylene, a patented multiple-impact helmet technology that is ideal for the aggressive riding style of action sport athletes. When conventional helmets take a hard hit, the foam liner compresses and stays compressed, losing most of its impact absorbing properties. Due to the advanced chemical structure and sophisticated processes used to create SXP helmet liners, PRO-TEC pushes beyond the norm by offering multiple impact protection that far exceeds the competition.